Ralph created a photo mosaic of me and sent it to my email today with the subject line “Would you be my 'crime partner' tonight?” It's silly, I know. Anyway, this photo reminds me of a mosaic which has been sitting in my draft box for God knows how long. Here is a mosaic of my friends and followers, all in big picture. Could you spot yourself in the mosaic? 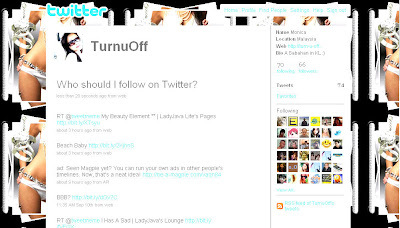 You can get your twitter mosaic here. I am on Twitter and I must admit I'm totally quite addicted to it. where got sill Mon.. i think it's sweet :)... Happy Friday to you and R dearie! 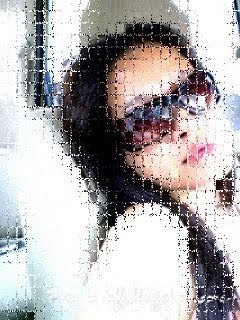 i see me on your twitter mosaic.. yeay! Nessa FC2! :-D :-D :-D hehe I'm following u too! Tweet tweet, will follow you everywhere you go.... virtually. i am not really active in twitter but i have an account.. will follow you now Mon.,. Cheers! wow, you sure have many followers. i think i'm the only one who isn't a twitter member. it can get pretty addictive, that's why it has never crossed my mind to be a member. Ooh! Yeah! I see my panda face there!! Yay!!! And of course, I am following you on Twitter!! Twitter is pretty addictive right? I love to tweet! Yeah la so sad I checked yesterday me bottom 2 edi huhuhu, suddenly only the rest got so many votes huhuhuuh…. Hehehhehehehhe abt our love life zaman dulu hahahahha! Im going to mandi and makan now Monica, see u later!! Of course I'm one of your followers, and glad to be one of them! I may have to post something like this on my site!